Is farm-to-table just a fad? 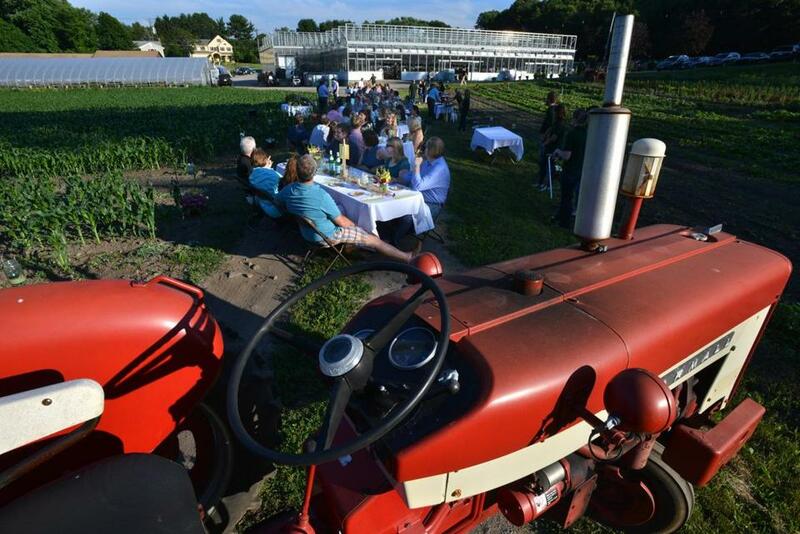 Diners enjoyed an outdoor farm dinner at Volante Farms in Needham. Amid this resurgence, it’s easy to forget that farm food was not always a luxury item but something fundamental. I’m at a farm-to-table dinner on Martha’s Vineyard. It’s a gorgeous summer night, the sky streaked with shades of fluorescent pink and orange. Close to 50 people are gathered outside the weathered barn. Despite the mud and dirt in the barnyard, many of the women are wearing heels, while the men soil their Topsiders. These farm-loving friends have each paid $125 to attend this dinner. The radishes come with no sauce or fancy sea salt. A diminutive woman standing next to me looks at the tray of radishes as if she’s falling in love. “Is that the most precious thing you’ve ever seen?” she says to no one in particular. “What an adorable little radish.” And with that she pops the little baby right into her mouth. Farm dinners like this have become popular across New England and around the country. The explosion of farm-to-table restaurants, CSAs, and community gardens are part and parcel of the same growing trend. And, according to the US Department of Agriculture, more than 8,000 farmers markets nationwide now offer fresh fruits and vegetables, a 500 percent increase from 1994. Whether you’re a chef or a home cook, the place to find your ingredients these days is on, or near, the farm. That should be good news. People are becoming more aware of what they’re eating, where it was grown, who grew it, and in some cases, even growing it themselves. But this newfound infatuation with hyperlocal farm food does raise the question: Are we seeing a genuine change in the way Americans eat and get their food? Or is farm food a fad? In other words, is the “preciousness” of a single radish, or the sense of fulfillment that some get from buying $12-a-pound heirloom tomatoes sustainable? Because if it is a fad, then eventually we’ll become bored with food from the farm. That would mean losing ground on healthier eating, preserving farmland, and moving toward a more sustainable food system. The stakes are high. It would be catastrophic to go backward from where we are today. Yet, amid this resurgence, it’s easy to forget that farm food was not always a luxury item but something fundamental to life. Many of our grandparents and great-grandparents farmed, canned, and planted Victory Gardens, because they had to grow their own food to survive and stretch thin household incomes. Before box stores and agribusiness, before Walmart and mega supermarkets, eating food from your own garden, or from the farmer down the road, was typical for many Americans. At Tuckaway Farm in Lee, N.H., Chuck Cox, 71, checks on the Swiss chard growing between rows of heirloom tomatoes. Cox has been farming “pretty much my whole life.” His father was a pilot and a farmer, and today Cox runs the farm with the help of his son and daughter and their spouses. But does attending a $125-a-plate barn dinner qualify as learning more about what you eat? Just because you spend your hard-earned food dollars at a farmers market do you really understand how food is grown? Is this what Euell Gibbons or Scott and Helen Nearing had in mind when they wrote decades ago about a new way for Americans to eat? Taking the optimist’s view, I’ve witnessed how kids’ eating habits improve when families spend less time and money at supermarkets and big box stores and instead pick their own fruit or buy organic vegetables from local farmers. But despite the popularity of shopping for food from local growers, this is still not a mainstream trend. Small-scale farming is on the rise. According to the Maine Farmland Trust, there are more than 8,000 farms in Maine, the highest number in New England. Even more significant is that the number of farmers under the age of 35 in the state grew nearly 40 percent between 2007 and 2013. “I grew an entire vegetable garden on a fire escape in Brooklyn!” Eve Turrow says. “Many of the thousands of millennials I interviewed [for my book] are interested in farming and growing their own food. They want to give up their suburban backgrounds and milk goats and grow potatoes and greens.” If the 20-somethings’ almost obsessive interest in growing vegetables and having the newest/coolest food on the block means a new generation of farmers and food entrepreneurs, then we need to take this food fashion seriously. We need to figure out creative ways for them to find financing and land to make that dream a reality. That, however, requires we look at farm-raised food not as something precious and luxurious, but rather an essential part of life: fresh food grown by a farmer — not a corporation and hold the chemicals, thank you very much — that sustains us, and keeps us healthy. Let’s get rid of the silver tray and embrace the dirt.